Cameleon LG E unmanned ground vehicle is being offered by ECA Group for EOD and IEDD missions. Image courtesy of ECA GROUP. The UGV is equipped with colour/infrared cameras. Image courtesy of ECA GROUP. 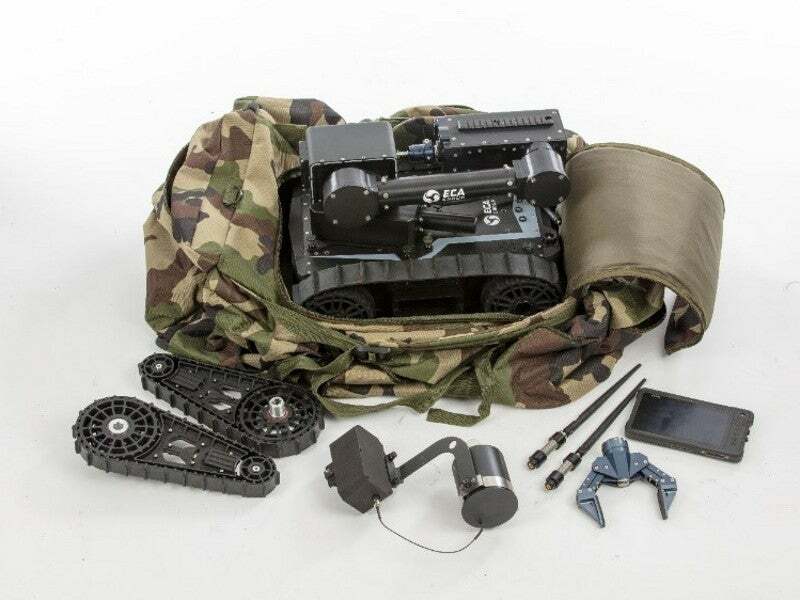 The Cameleon LG E UGV can be carried in a backpack by a single soldier. Image courtesy of ECA GROUP. Cameleon LG E is the latest addition to the Cameleon range of unmanned ground vehicles (UGVs) built by ECA Group, a robotics and automatic control systems manufacturer based in France. The robot was unveiled at the International Defense Exhibition 2019 (IDEX 2019) held in Abu Dhabi, UAE, in February 2019. 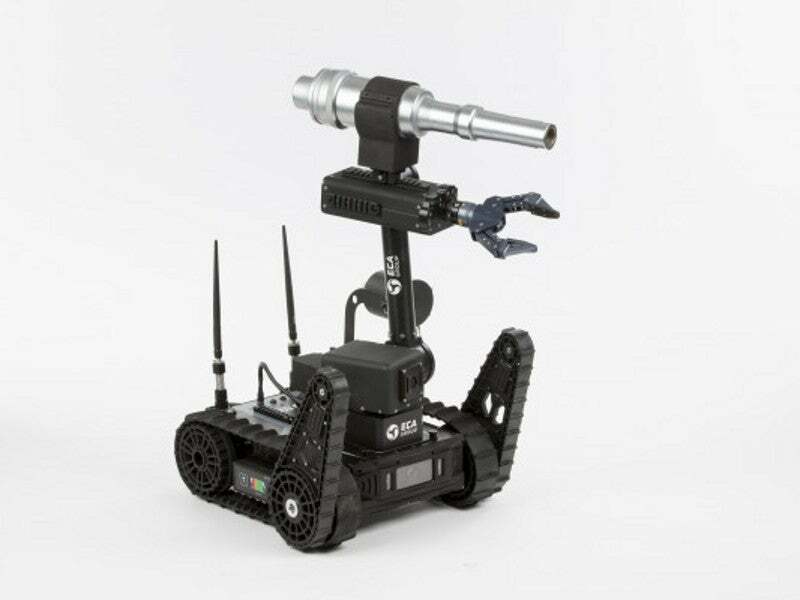 The UGV is designed for use by explosive ordnance disposal (EOD) and improvised explosive device disposal (IEDD) units to remotely detect and neutralise explosives and hidden triggering devices along culverts, terrains, vehicles, and homes. The UGV is also suitable for reconnaissance missions. Cameleon LG E mini UGV features lightweight and modular design. It is built on IP65 water-resistant chassis, fitted with three Picatinny rails. The base weight of the robot with two batteries is 12.2kg, while the total weight of the system including a manipulator arm and a small operator control unit is less than 20kg. The vehicle is capable of carrying payloads of 15kg. The UGV’s mission module disrupter allows for the mounting of accessories. It provides a tilt angle of 45° to -45° for 12.5mm disrupter and between 20° and -20° for 20mm disrupter. Cameleon LG E can be equipped with a variety of optional payloads to support missions such as reconnaissance and chemical, biological, radiological, and nuclear (CBRN). The UGV, along with the standard mission equipment, can be carried in a backpack by a single infantry soldier. The robot comes with a four electrical-axis, hot-swappable removable arm, which integrates an anti-collision system for safe operation. The manipulator arm has turret, elbow, and wrist joints to provide maximum flexibility. It can automatically reach any position in its workspace. It also integrates two Picatinny rails for holding payloads, and three cameras with lighting for gripper, turret, and disrupter. The arm has a wider aperture range of 120mm and allows for continuous 360° rotation of the gripper. The optional equipment for the robotic arm includes a laser telemeter, a disrupter holder, a CBRN sensor holder, and cutting tools. The Cameleon LG E UGV uses inclinometers for pitch angle measurement and global positioning system (GPS) for accurate positioning data. It carries two radio antennas to transmit images and data to the operator control unit and receive commands from the control station at a distance of 500m. The radio range can be extended up to 1km through a fibre optic cable. The microphone and loudspeaker devices aboard the robot have a maximum range of 5m. The robot is also outfitted with a colour / infrared camera along with white light and infrared devices in both forward and backward of the chassis to generate high-resolution images of the field. It can be optionally installed with a thermal camera and two side colour cameras with lighting. The UGV is also compatible with a variety of mission-specific systems such as laser range finder, as well as radiological and chemical sensors. The UGV’s operator control unit generates a three-dimensional active model of the robot on three rugged, full high-definition touch screen displays of 5in, 7in, and 10.1in. The ergonomics of the control system allow the operator to handle the robot’s arm and sensors and interpret imagery and data transmitted by the robot. Cameleon LG E’s control unit is provided with an auto-diagnostic system to minimise the operator’s workload. It is resistant to water, dust, shocks, and extreme temperatures. Powered by two hot-swappable batteries, Cameleon LG E operates at a speed of up to 5.1km/h. It can attain a speed of 11km/h when fitted with a special motor. The UGV is capable of enduring for up to four hours based on the mission, while its maximum endurance can be extended up to 15 hours when deployed in a surveillance mission without movement. It can withstand temperatures ranging between -20°C and 55°C. The lifting and towing capacities of the UGV are 4.5kg and 20kg respectively, while the horizontal and vertical reaches are 91cm each. Equipped with a pair of motorised flippers, the robot has the ability to climb obstacles of 20cm height and 45° slopes. 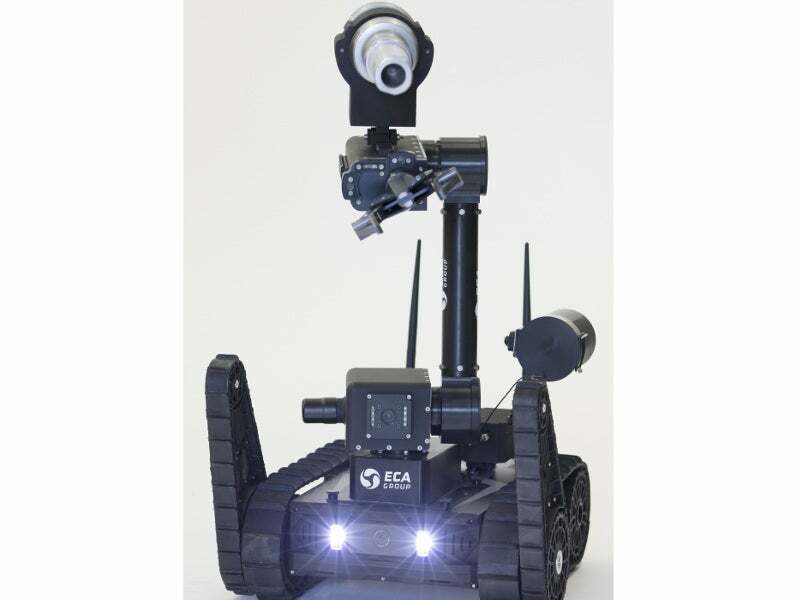 ECA designs and manufactures unmanned systems for inspection and intervention tasks covering the needs of different markets such as the defence, security, nuclear and chemical industries.